Heart of the King's Daughter: What is Your Gift? Every person is born with a gift -- a special gift from his Creator. One cannot say, "I do not have such gift," for the Father never creates and sends out His people into the world without this gem. The gift that we received from Him we must acknowledge by utilizing it, not for our own accolades, but for the glory of His son, Jesus Christ. Romans 12:6-8 encourages us to use our gifts. As people who belong to the body of Christ, our contribution to the church is essential. Our local church needs any minuscule help we can pitch in. Most of the time, we look at ourselves of somebody the church does not need. Instead of viewing ourselves as God's instrument to further His kingdom, we belittle our capabilities, and count ourselves unimportant. Thus, we shy away from getting involve. Every personal gift may look similar from other individuals, enough to make us think we are not needed. The thing is, our Father in His infinite wisdom designed every individual a unique, special twist in that gift that no other person possesses. We may not recognize it, but our Creator who formed us, does. No one is too small in the eyes of God, specially when it comes to the works of His purpose for the entire world. Our presence and the gift He gave us greatly matter. We don't have to be in the limelight of the church's stage. We can serve behind the curtains and make a huge impact on the undertakings God puts in our hearts. People working behind the scenes are the backbone of the church. Without us, the church is crippled. The church is stagnant, and worse, collapse. 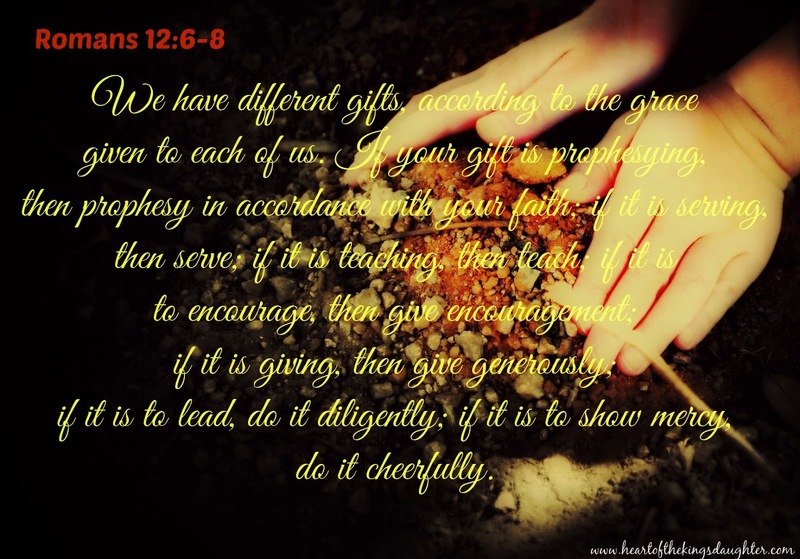 What is your gift? How much are you willing to share of it to the church and to the world? Would you rather keep it to yourself or make use of it for His kingdom and glory? Child of God, you are precious. Far valuable than the any gemstone this world can offer.